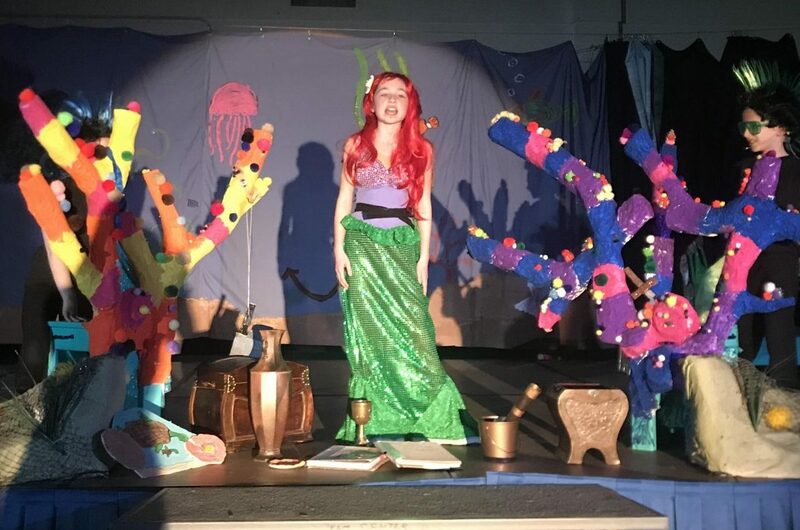 Lead role Jillian Willwerth sings “Part of Your World” surrounded by props crafted by the Scenery Crew. The song is one of many Willwerth’s voice is featured in. Scuttle, played by Andrew Pizzi, speaks to Ariel, played by Jillian Willwerth during their scene together in The Little Mermaid. Fourth Grader Andrew Pizzi joined Drama Club at South School this year, walking into the audition room with a love for singing and a family background of being musically inclined. 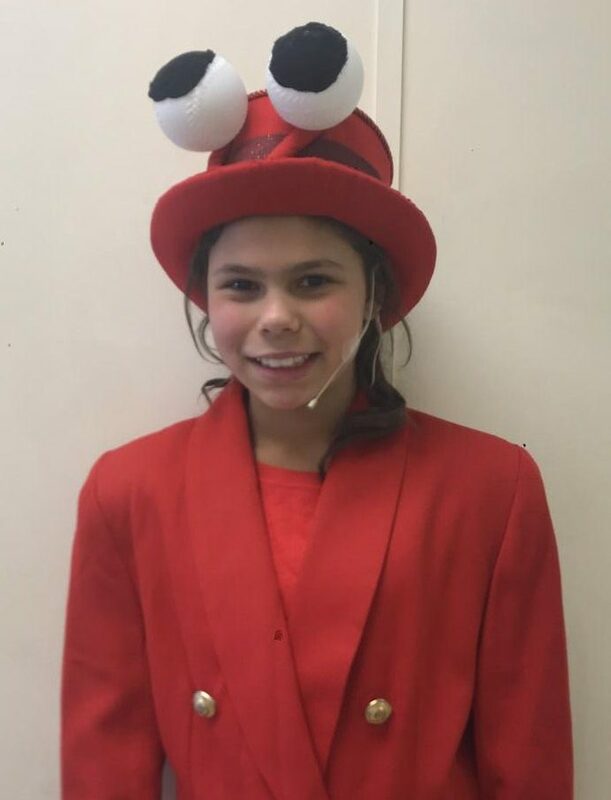 Pizzi made his debut as the character Scuttle on March 28 and 29 during South School’s performance of The Little Mermaid Jr. The school has been putting on plays for years for the staff, students and families. With the help of 32 parent volunteers and teachers, students are able to fulfill their dreams of being in the stage lights. Second grade teacher Melanie Smith has been working with the program for years. Like many other volunteers, Smith’s position isn’t limited to just one task. “Ariel” and “Flounder” swim through the water and encounter other creatures of the sea. 5th grader Alexis Thibodeau shows off her costume made by Hilary Walter and Alicia Sovas. Along with the reward of seeing the dances come together and the stage lit up perfectly, Smith said her gratification comes from what the actors get out of the experience. 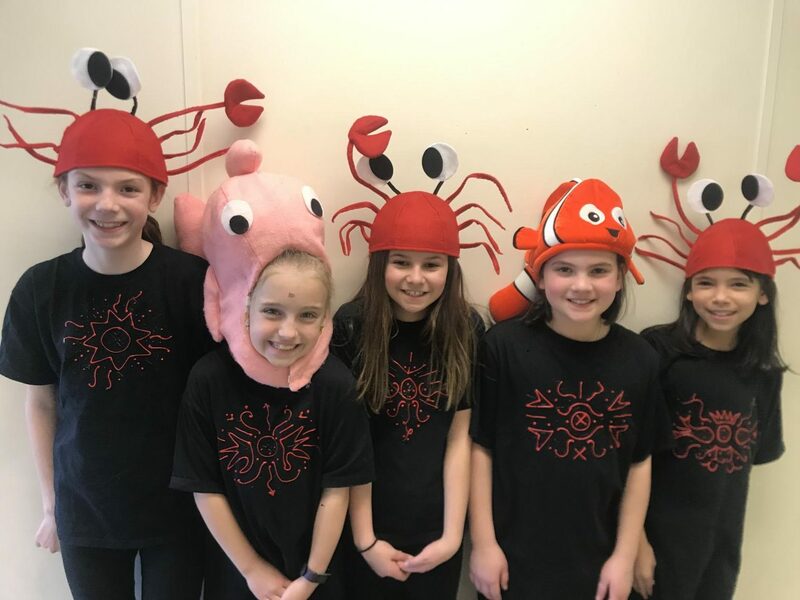 The roles of “The Sea Creatures” consisted of Hannah Wheatley, Lily Lynch, Anna Linkov, Julia Morrison, Emily Spaulding, Sayde Thompson, Madison Swazey, Madison Harper, and Linette Pomales. The girls dazzle in several musical numbers throughout the show. The club is open to fourth and fifth graders, each grade having bunches of kids eager to join for their own reasons. In years past, the play has been a hit amongst both the actors performing and the students watching. 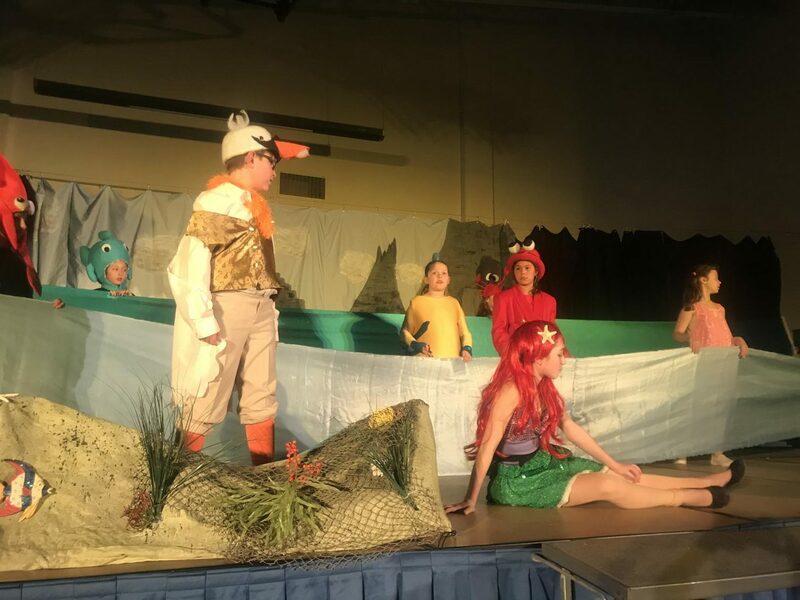 The play had several daytime and nighttime showings, with students coming to support their friends during the day, and parents cheering on their kids at night. For students like Andrew Pizzi, the experience of being apart of the team makes him glad that he joined drama club. Truly a great story about very talented young people. Loved the pics too. Awesome job.